Fellow Spit pilots ... To defend our airspace against evil forces ... Up grade your ecs so you can fly 4 cell . I fly a 4c with a 40c discharge and a 9x6 apc prop . We're getting close to 80mph on level passes , fantastic climb outs , just breath taking flying . 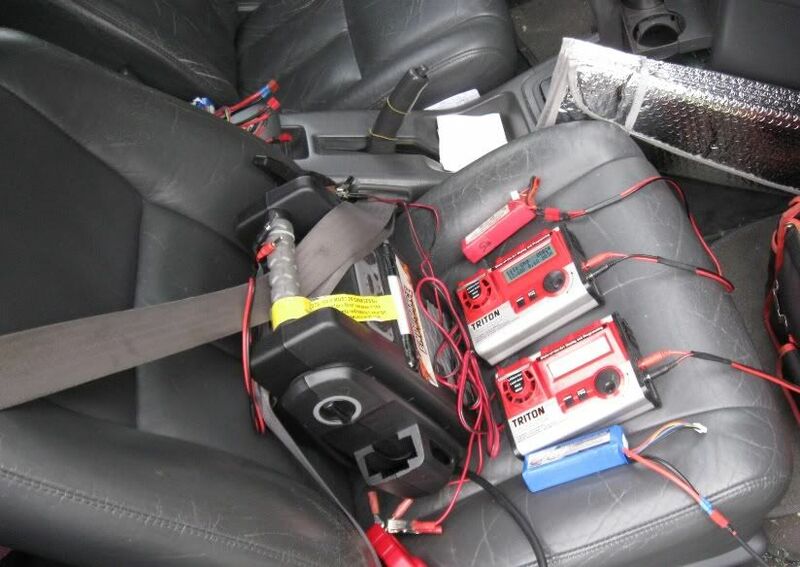 You'll love it .... TTFN ..
Stock ESC should handle 4cell. How many amps does yours pull? How are you measuring the speed? [sm=lol.gif][sm=cry_smile.gif] deothoric, yes. Please see the 70% added flap area over stock that I use very effectively on ROG take offs with my killer size PZ 109 pictured on my CALL TO GLORY web site. It is listed near the top of my HANDY WEB PAGE FINDER that now pops right up when this web site name is typed into a good search engine (sometimes URLs don't work). My landing skills need more work before I enstall my retracts. almost intact - cannons on both sides were gone with plugs of foam and the wing tip that hit the ground could be easily bent and glued back into proper shape. I bought a complete replacement airframe - couldn't bear to be reminded of that traumatic event. I have a wonderful time at my one of my RC Clubs in Central Florida known as Moon Port Modelers RC in Titusville, Florida and near the Space Center. Lots of people and it looked like a Fun Fly but, it was lots of new members and the Northern Birds are coming back down for the winter. I was able to fly my Spit in the early morning hours before the wind came up and those there were just amazed how well it flew and they Loved the Retracts. As I was flying, the wind picked up and I did not noticed as the model tracked very well and I commanded to perform all kinds of "Scale" moves and those there cheered, especially when I landed as there was a good amount of wind at the time. Later in the early evening I came by for some more action and I had the entire RC Club to myself and took the time to take some pictures after flying my Spit for another two wonderful flights. I did notice that the Right Retract was having trouble going inside the wheel well all the way and had to place the model upside down on one of the Model stands and I carefully took off the Side Strut plastic cover and with two pliers I bent back the "Pre-Bent Strut" so, the wheel NO longer made contact with the edge of the wheel well opening. Other than the adjustment, all went as planned and it was a terrific day with great weather conditions. Here are a few pictures from early evening before the Sun went to bed. Just another Super Morning / Day in Central Florida and especially Orlando, Florida where I visited a new RC Club that I made myself a member of back mid last year and they have installed a runway made of recycled Concrete material and padded down using a large machine. 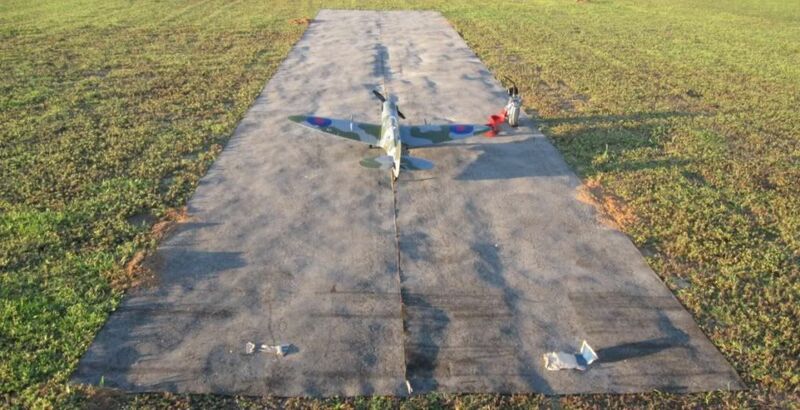 From all of the places that I have flown my Park Zone Spitfire Mk IX, I can tell you that this is the best type of surface I have encountered to take-off and land. 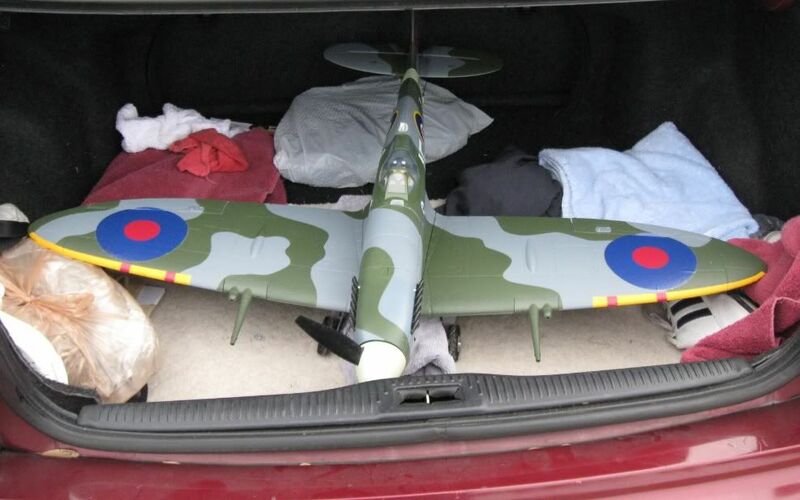 The model's ground handling looks so realistic and I flew the Spitfire for 4 spectacular flights of 6 minutes each and it was balls to the wall flying in rather calm conditions and right next to a lake. This is the only thing about this club that you really can not be weak at the knees to fly out of this location as a result from the Lake. The model took off in less than 15 feet on this surface and it was applying gradual throttle and it did NOT veer off to the Left and it lifted it's tail wheel just like the Full size and made a super scale take-off that everyone enjoyed flight after flight. The landings were something to see as this place does have trees surrounding the field and perhaps helped in keeping the wind down without any cross wind thereby, allowing perfect Landing facing the North and was able to command the model to gradually sink in level flight right at the edge of the runway for a smooth and super scale run-out and most especially without nosing over (never did the model even come close to exhibit a NOSE OVER!). 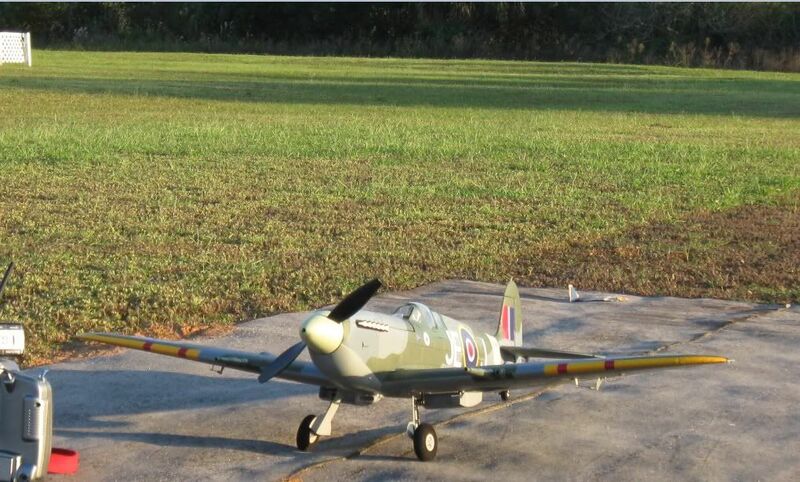 As a matter of fact I was able to command the Spitfire to perform some neat one wheel main gear landings / touchdowns. Again, a few pictures from this morning at the Orlando, Florida RC Club. Over Looking the Large Lagoon! Closeup Over Looking the Lagoon! Our speed is measured by a speed gun ( which is used by a race team ) Have to fly real close because of size . I burned up the stock ESC using a 4c . I put in a 60 amp . As for watts , no clue . Earlier tests at one mile plus altitude seemed to show that the 11X7 SF APC prop would work really well as my best high altitude prop using the stock 30 Amp ESC. At the continental divide there was a rather large asphalt parking lot and had I felt more confident a surely fatal mistake due to wind turbulance, etc. would have been made. After taxiing around some the irresistible urge to do a simple little test hop became overpowering. ROG more or less straight into the wind, the ship rose a few feet into the thin air, chopped the power and bounced in for a "landing" (?) that succeeded in chipping the prop and knocking off a wheel cover - didn't flip over - my wheels are located far enough forward now to keep the ship upright most of the time upon landings. 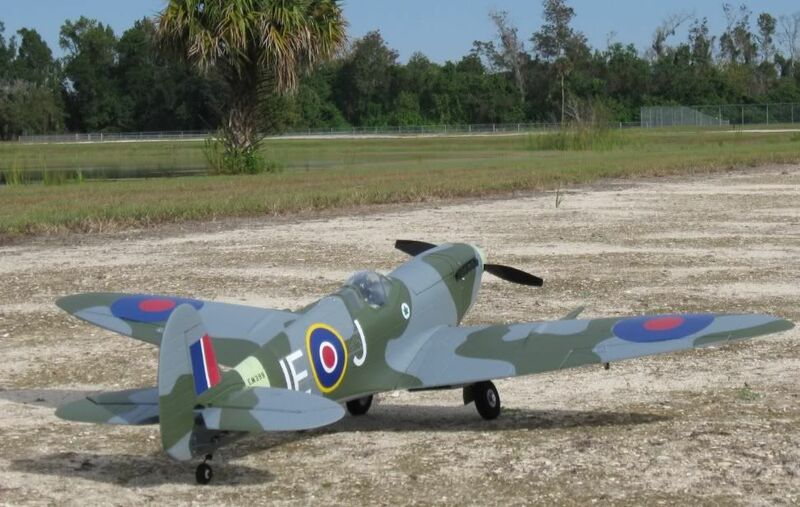 After putting up a fairly nice GUNFIGHTER flight over a Soccer field at 8800 feet, the Mk IX Spitfire did its thing. Fortunately, I was high enough this time when throttling up without adding some right rudder that put my Spit into a nasty tip stall, I was able to pull out a few feet above the ground and make an uneventful landing, except for the terrifying truma of the event, of course. There was something really weird about that 11X7. Although it was necessary to remember to not use full throttle much at that altitude to prevent burning out the ESC, there was a startling lack of power. I've concluded that under some conditions the 11X7 prop was stalling. This is very strange because my brushed motor powered PZ Spitter uses a slightly modified version of this prop and flies beautifully with it. I've modified the prop now to look a lot like the Mk II's version with its more curvaceous leading edges shape and more blunt airfoil leading edge shape like what works so well on the Mk II. As an additional test high altitude prop I created a slightly wider bladed and greater diameter prop that runs at just over 35 Amps with a fully charged battery. The new test prop is made from a 12X4.7 APC SF prop. My objective is to get by without having to buy a 40 Amp ESC to enjoy my special "Just Fly At Any Altitude" fighter plane aerobatics. FIGHTERS, AVIATION'S ULTIMATE CALL TO GLORY, HONOR, AND IMMORTALITY - Please see immortality promoting Blog - Rom. 2. [sm=lol.gif][sm=cry_smile.gif][sm=cry_smile.gif] Just got shot down by the "Sorry . . .timed out enemy" again. I will try again to post my message here. Couldn't do it untill I had already composed the next message. SOME STRANGE STUFF IS GOING ON HERE. Anti-science/modeling hackers seem to still be hanging around. A TV news report said there were 55,000 viruses on the web a few months ago. A seemingly honest web sight said there was just over 1,000,000 viruses on the web for the very first time. Oh, and the energy monopoly is surely doing its part to keep multi-trillion $$$$$$ "cash flow" moving in the "right" direction, of course. Shot down again - will try again later. In the meantime new recruits, click on "Rating" at the top of the main first forum page to enjoy some of the excitement of other Ace Fighter threads. FIGHTERS - AVIATION'S ULTIMATE CALL TO GLORY, HONOR, AND IMMORALITY - Please see immortality promoting Blog - Rom. 2. [sm=lol.gif][sm=cry_smile.gif] There is nothing more relaxing and rewarding than "prettying up" a Mk IX Spit after a long non-stop stressful mission. 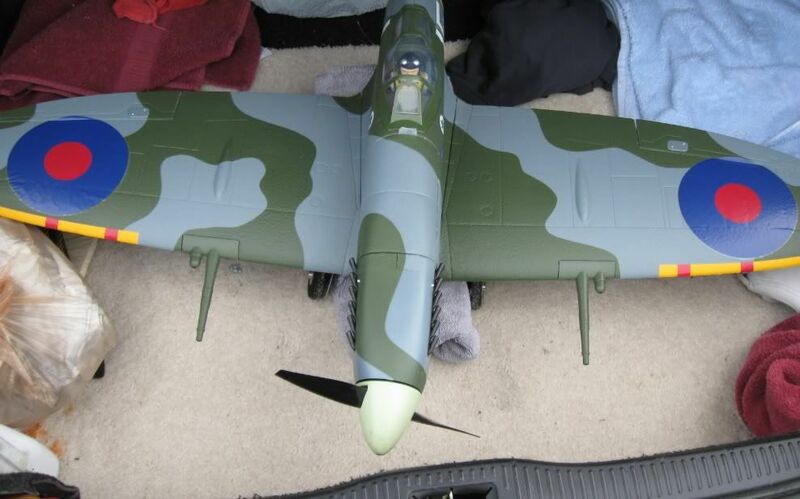 As I look up from the Lazy Boy chair now, the beautiful Spitfire now sports a virtually indestructable scale antenna system and a "P-40" style "cross hairs and post" sight system that allows two ways to pull the hatch up without having to use "un-scale" looking tape. I finally ordered a nice little 40 Amp ESC to remove the stress of possibly burning out the stock version with just a little too much current on just a little too hot of a day. When I get nervous I tend to behave more neurotically than usual - must eleminate all unnecessary hazards. Just read a sad fact about the shrinking number of young people interested in aviation by the AMA President. Us fighter enthusiasts might be able to have a decisive influence in encouraging more young people to be more active in modeling. The key to victory is surely the kind of excitement that only fighters are able to generate. Providing "interest destroying negativeism" can be kept to the absolute minimum, our modern high performance capable, very scale looking model fighter planes used as history/science attention getting teaching aids surely can't fail, especially once "our culture" realizes just how useful modeling can be at this stage in the development of Western Civilization. We'll save something for later. Aim High - Fly - Fight, and keep on winning! [sm=lol.gif][sm=cry_smile.gif] Leutenant Fritz Von Schnitzengruben, in all the excitement of heoric swirlling yanking and banking all out full throttle combat your challenge was missed. Sorry about that. Now the issue has already been decided. You have no chance of shooting me down because it has been proven beyond any shadow of a doubt that I am fully capable of shooting myself down before you can even turn on your gun switches. Stand by while I copy some really fun concepts from an issue of FIGHTERS magazine, (summer 2001, P. 6). Is there a word in the lexicon of aviation that conjures up a more exciting image? Is there any word that says so much with so few letters? Also pictured on the page and on other pages is the one and only picture of a P-40 that I am visually emotionally imprinted on - the tigershark mouth, etc. I do hope to own a model that looks exactly like that picture, gun sites and all - no, I don't care about landing gear but that could never stop me from buying one. Yes, the gun site on the picture is what inspired what ended up on my Spit battery hatch. What I might have done if I had thought about it at the time would be to have used my "circle master," fine point Sharpie, and paper punch on some thin clear plastic like what our recievers or ESCs comes in. Then simply draw a convincing looking crosshairs sight and punch out the sight to be put between two pieces of clear tape for use as a tab for pulling the hatch off instead of unexciting tape only. Because of location on the F4F and P-47, I used a convient length of "new tech" fishing line with a convient size "ball of knots" on top and a convient length of line secured at the underside aft end of the hatches to arrive at "antenna" looking hatch opening "tabs" on them. THANK YOU FELLOW VETERANS FOR ALL THAT YOU DO! Patriotic Americans think about and pray for you often. If God be for us who can stand against us? FLASH! Exciting news!!! Parkzone's fabulous two page fighter plane ad is on page 24 & 25 of "WW II Fighters" Flight Journal COLLECTOR'S EDITION. Ya gotta see this historic ad in this real fighter plane magazine. In its most recent air battle yesterday in what has been refered to as the "ultimate flying experience of combat" the PZ Mk IX Spitfire has accomplished its mission to TAKE BACK THE SKY. Finally got the best performing prop installed on my Spit. Turns out that the APC 12X8 E is the way for me to go. That prop has already proven itself on the PZ P-47 using a 40 Amp ESC from sea level to a mile and a half altitude. All of my European theater fighters are now fine tuned for any "Just Fly at Any Altitude" missions. I do have to fly my newest GUNFIGHTER with its new special "automatic variable pitch prop" at high altitude, but that should be only a formality. The PZ Wildcat has already proven the special prop, and it almost but not quite made the grade on my almost quarter pound heavier War Weary GUNFIGHTER at nearly one and a half mile high altitude on its last long range fighter sweep. Enjoyed a very nice landing on some "goose grazed" soccer fields, and a lot of taxiing around to get the battery down to storage charge level. I might just go ahead and install my retracts in this Spit if I can figure out a nice way to make them work with the new wheel wells needed to accommodate the forward bent struts modified to make landings easier. 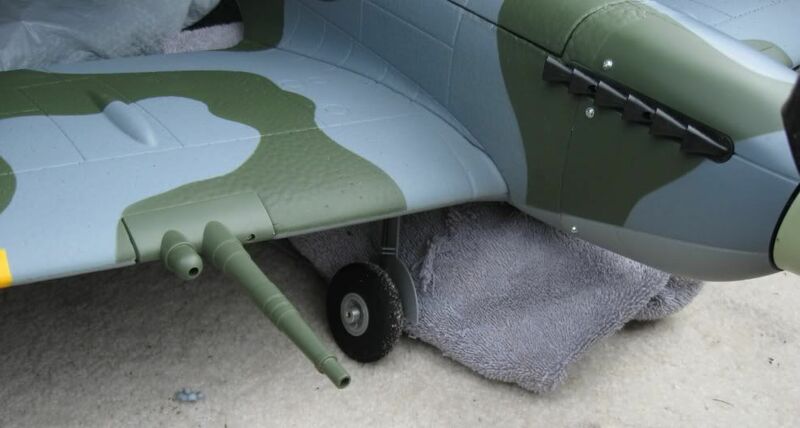 I was astonished to experience the aerodynamic drag of the wheels down configuration that simply would not let the Spitter perform with the same prop that now seems to work so well on the PZ Jug. The low pitch prop that allows the '47 to act like a "motor powered glider" and fly very realistically and unrealistically slow in the wind, simply gives up on vertical maneuvers when used on my currently configured Mk IX. (unable to fix the PC anomaly here - was able to out maneuver other PC bogies that tried to shoot this post down in flames) hole closer to the elevator than is recommended in the Instruction Manuual. I pacticed low speed flying and switching back and fourth between high and low D/R that helped provide confidence to land using high rate in order to pull full up elevator on touch down to help keep the tail on the ground. The Center of Gravety is also located 1/8 inch behind the Manual's recommendation. The spinner nut has .5 ounce ground off, and the receiver and ESC are shifted back some to get an optimal CG location. I couldn't do much maneuvering yesterday as the fog/clouds had settled in too low, but what flying I was able to do was, as has been mentioned so often by others, really great! P.S. I wonder who is tampering with my smileys? On Saturday morning I joined a great bunch of guys at an old retired Navy practice training area in Orlando, Florida and Bud was kind to record my flight with my Spitfire. It still flys completely STOCK with the optional E-Flite Retracts and Pre-Bent struts. quapoman, great work as usual! If I ever run into a doubter about stock performance he will be sent to your posts! I'm continuing to practice the kind of maneuvers that can be seen at full scale air shows and am "sort of improving maneuvering skills." It's hard for old dogs to learn new tricks. I still get so excited that it is sometimes very difficult to do the right thing to get the performance that is possible with our fabulous fighters. P.S. I still wonder who is responsible for tampering with my smileys? Sweet Merry Christmas and Happy Hanukkah, all! Fly in Freedom! Thanks Jimbo, I hope you had a good holiday season also. I was hindered from making a response probably as a result of the fog of war. Something funny happened the other day when I checked to see if there was any information about one of the "German pilots" (reported by you) that shot me down recently. After typing the name into Google to see if he was a famous German Ace, having just posting it on RCU, up popped my just posted post with said name. Evidenty, that German pilot's claim to fame rests on being mentioned in my post. I would have used an "action smiley" here but they can't be trusted to perform as advertised yet. Weather permitting my beautiful Spit will show its ROG stuff today. The strategy here is to adjust in as much up elevator deflexion (British spelling) angle as possible for landing touch down purposes to keep the plane from flipping over by adjusting high/low, expo rates, and optimum horn leverage. At the moment high rate has the maximum deflexion angle at double the optimum normal low rate. To use Bomber Harris' words, "We shall see." KEEP ON TAKING BACK THE SKY! PS The war against hackers continues. They just keep right on coming no matter how many of them get mowed down! Keep it up suckers, we have plenty of ammo and are getting more every day. You are being watched with a mixture of pity and rage. You can't win! [ ] Just paid the price for failing to keep my security scan going. Pressing the "enter" key caused everything I had spent a few hours (yes, I'm a slow composer of posts) working on to disappear. Its always the one you don't see that gets you. My SA needs to be improved. Everything works as expected. Our Spit is really something, no trim adjustments were needed during yesterday's flying excitement. One time the ship was accidently left on high rate and was so stable I didn't know about it until some of the usual maneuvers were flown. The big change that really makes my slightly modified machine keep its tail on the ground during ROG was adjusting 25 degrees maximum elevator deflection angle for good ground handling on the rough area circumstances forced me to use as a landing strip. At first my wife was unable to tell the difference between the stock rudder shape and the one I came up with using my spare Spitfire tail section, once I showed her the .1 inch difference in the rudder chord width at the final grove near the top of the rudder she finally could see the difference. It only took a few minutes to modify that curve on the top area of the rudder to look more like a full scale Spit IX. The area was sanded and kept flat at the trailing edge, finish is CA glue and the use of a green Sharpie. Next time I conjure up some touch up paint I might use a little to go over the area. For now It looks great and close enough to the real thing to produce scale joy. Yes, I have been guilty of looking at too many pictures of the full scale machine. In the ultimate turn and burn, yank and bank dog fighting combat in the war torn skies of the past few days, our fine tuned Spit overwhelmingly demonstrated its ROG capability. It was able to take off from grass that I just knew was virtually impossible. The new trick that works amazingly well in grass that is "too high" (?) is the use of thirty (30) degrees of up elevator deflection angle for practical ROG on high rate with expo/DR tuned to provide Instruction Manual recommended low rate elevator angle. Gotta go, or get shot down again - I shall return. It was that dastardly "sorry . . . timed out Fascist" enemy again who slithered around and shot me in the back. He's gone now compliments of ever increasingly improving web security. The pitiful soul, he just can't get it through his thick skull that all he is doing is increasing the challenge to beat him. Ain't we got FUN!? Okay, we will try this again. I hope my wing men will clean them off my tail now that it is obvious what is happening. Our hacker Fascists know that they, at best, are only providing a very weak "rear guard" action. The truth is going to come out whether they or anyone else likes it or not! So, back to the conquest of the sky - my Spit's new adjustable fixed flaps look really great and should help provide some confidence building performance advantages for some of us aviators with chronologically challenged eyes, especially those of us who enjoy actually seeing scale features when the ship flies by slow enough and close enough. More testing under combat conditions will be needed to sort things out. So it isn't just me, Mad Web: The slow fly-by IS THE COOLEST. It is an affirmation of the labor, the beauty and art in what we do with these noble birds.I love it! Would an instructor tell me it's a "no-no"? I don't know, but under the right wind conditions (light and steady) I'm totally comfortable with it. Can you see the little pilot figure as he flies by you, giving you a thumbs-up and a salute? If so, that's the time to take a break! Hey, Suburo Sakai, great to see you back here in fine fighting form! For a while there I thought you may have been captured by Fascist forces, tortured, brainwashed, and/or killed and an imposter had taken over your identity. Just because I am paranoid does not mean they are not out to get us, you understand. I better try to post this in order to not have to suffer at the hands of the "sorry . . . timed out" thug. Yes, though I enjoy reading about the excitement of others who enjoy wild speedy machines, personally, my thing is to try to duplicate scale like speeds and enjoy the emotional imprinting I have on all of my fighters. Slower than stock performance can be accomplished by certain minor modifications and prop changes. At the moment I am back to using a very nice performing low altitude APC SF 11X4.7 Prop. If push comes to shove and I need ultimate "Just Fly at Any Altitude" performance while employing the 40 amp ESC, the killer 12X8 E APC prop is what will be bolted on my Spit's nose. Prop clearance can be an issue with this prop, I have already destroyed one. I don't recall ever being able to see the pilot on close, slow flybys. I usually am satisfied with shapes and colors. On a cloudy day like today everything is black beyond about 200 feet. On a bright sunny day I can enjoy the black and white invasion stripes on my P-51 and P-47 fighters at around four hundred (400) feet maximum distance. Yes, you can count on me to break off any air attack immediately if I start seeing any kind of little man in my plane waving at me. Speaking of "emotional imprinting" I now have two (2) copies of "Clash of Wings - The Fighters Education" - "glitch" here can't be removed. First time I tried to DVR that program from the Military Channel only about five minutes of the program ended up getting recorded. So now I can thoroughly enjoy it any time. I especially enjoy the 109 presentation in the number one spot as well as its use in the introduction of the program. It gets enjoyed a lot. I should be able to put up CAP sorties some time this week. If not, my peak charged batteries will be discharged to a safe storage level of 11.1 - 11.5 volts maybe by taxiing around in my back yard and enjoying the ultimate ROG capabilities of the now fine tuned Spitfire and Messerschmitt. In the meantime, Aim High, Fly, Fight, Win! PS Please check out my latest 109 post that failed to come to the top when I posted it today - fun stuff. PC is acting up unusually weird recently, coincidence? The world wonders. 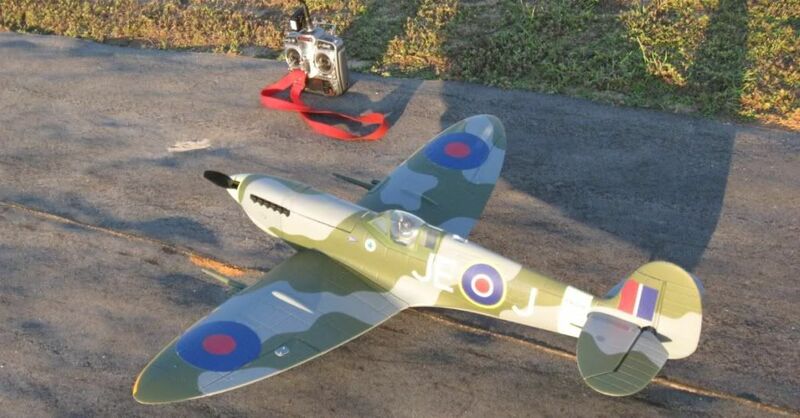 My Spitfire has completed its 35th mission flight and goes to show the durability of this wonderful Park Zone Spitfire Mk IX model! Here is the Video showing the 35th flight!